Traveling Choir sings Sunday, September 28, 2008 at Grace Lutheran Church, Waupun, WI. Service time is 9:00 AM, Warmups will begin at 8:00 AM. The bus leaves WLA at 7:30 AM. I'll post recordings to this article tomorrow after the service. Students should be to Good Shepherd by 7:00 AM for warmups. We will be singing in two places before the sermon in both services, and leave after we are done in the second service. There should be a snack provided in between by the congregation. I didn't intend to write this song. It just happened. It was the Friday before the school year was about to begin and I was reading Ps. 32. I was preparing the choir devotions for the year and read Ps. 32:7 ("You are my hiding place; you will protect me from trouble") and a melody immediately popped into my head. As is typical for me, I wondered if I had ever heard it before. I hummed/sang it for a couple people that night. Only one person said it sounded somewhat familiar, but when they sang back to me what they thought it sounded like, I knew what I was hearing in my head was different enough to be unique. So the next day, the Saturday before the school year, I sat down at school and started singing it, playing it, and writing it down. The verses came first, but the refrain was more like a descant, with long notes and octave leaps. It didn't sound at all like a vocal meloday for a refrain. So I played the chord changes on the piano under the descant and, slowly, a vocal refrain emerged. It wasn't until this point that I realized that I could set this year's theme, Micah 7:7, to that melody. Then I knew a new song was born. Thank you, God, for letting me hear it. Can a song incite a riot or get you thrown in jail? 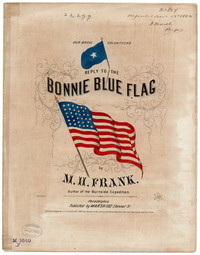 The Bonnie Blue Flag was such a song for the South during the early years of the Civil War. It made Confederate hearts burst with pride for their newly formed "Confederate States of America", but it was so powerful that it was banned by the Union generals towards the end of the Civil War . 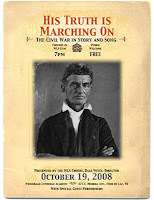 Anyone caught singing it could be fined or even thrown in jail (even though John Wilkes Booth got away with singing it)! 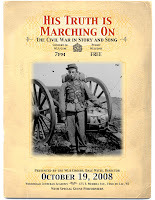 YouTube video of Bonnie Blue Flag as sung in the Warner Bros. movie "Gods and Generals"
Need more posters to put up at your school for the WLA Fall Choral Concert "His Truth is Marching On – The Civil War in Story and Song"? Click below to download PDF files of your favorite posters. 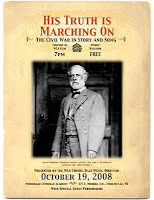 Watch this article for more posters every week showing different historical figures from the Civil War. Collect the entire set! Students and Faculty from WLA will form a choir to sing In Christ Alone on Saturday, Sep. 13, 2008 for the 11:00 AM Christian funeral of Michael Stowe at Immanuel Lutheran Church, Oshkosh, WI. The choir will meet at Immanuel at 10:30 AM on Saturday to warm up. Students in need of a ride should call Mr. Witte at 920-251-4490. We are all saddened by this sudden loss of the Stowe family's father, but we rejoice with them that Michael is now enjoying the place that Jesus has prepared for him in heaven. We all watch in hope for the second coming of Jesus and wait for God, our Savior, to take us to be with Him. More than 1,200 schools in the US and Canada offer some form of music education. In Tune Monthly pi cked the best of them in their October 2008 issue. You can view their college list here. The article acknowledges that many "traditional" music schools are now updating their technology and contemporary music offerings because the way music is created, composed, performed, recorded, and produced is constantly changing. McNally Smith, in St. Paul, MN is a contemporary music school that offers degrees in Music Performance, Music Business, Recording Technology, and Composition. The school is beginning a new Bachelor of Science in Music Production program for music producers this fall. Students oversee and album production form start to finish and are required to study music theory, composition, arranging and performance, technology and business, and general liberal arts subjects designed to round out their educations. Bridge to Music - THIS IS AN AMAZING SITE! The Student's Guide to College Music Programs by Hal Leonard Corp. Freshman Choir students need to bring black pants and white dress shirts (guys need a tie) to school tomorrow (Thursday, Sep. 4, 2008) for Picture Day. I forgot to mention this in choir today. My apologies!!! The Wisconsin School Music Association offers a music list of more than 5,000 carefully selected titles to promote musical growth through practice, performance, and evaluation at WSMA-sanctioned music festivals. Each year, more than 220,000 students take the initiative to participate in WSMA festivals, and use the music from the WSMA Music Festival List. Wisconsin teachers annually volunteer many hours to review and select music for this list. 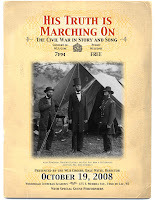 There is an amazing collection of 2588 pieces of original sheet music from the American Civil War called the Civil War Sheet Music Collection on the Library of Congress website. 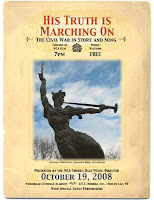 The pieces listed below are some of the songs I will be introducing to the choirs in preparation for the Fall Choral Concert: "His Truth is Marching On – The Civil War in Story and Song", Oct. 19, 2008, 7 PM in the Winnebago Lutheran Academy gym.